Aicardi-Goutiéres syndrome (AGS) is an early onset, progressive encephalopathy characterised by calcification of the basal ganglia, white matter abnormalities, and a chronic cerebrospinal fluid (CSF) lymphocytosis. Cree encephalitis shows phenotypic overlap with AGS although the conditions have been considered distinct because of immunological abnormalities observed in Cree encephalitis. We report that levels of interferon alpha (IFN-α), a marker of AGS, are raised in Cree encephalitis. Moreover, linkage analysis indicates that the disorders are allelic and refines the AGS1 locus to a 3.47 cM critical interval. Our data show that a CSF lymphocytosis is not necessary for the diagnosis of AGS and strongly suggest that AGS and pseudo-TORCH syndrome are the same disorder. Recognition of immunological dysfunction as part of the AGS phenotype provides further evidence of a primary pathogenic role for abnormal IFN-α production in AGS. In 1988, Black et al5 described an early onset, progressive encephalopathy in an inbred Canadian aboriginal community. They termed this disease Cree encephalitis and distinguished it from another neurological condition, Cree leucoencephalopathy, occurring at high frequency in the same population.6,7 Cree encephalitis is characterised by severe psychomotor retardation, progressive microcephaly, cerebral atrophy, white matter attenuation, intracerebral calcification, a CSF lymphocytosis, and systemic immune abnormalities. In 10 of 11 affected children described, premature death resulted at a median age of 20.6 months. Although, these features were noted as reminiscent of AGS, the conditions were considered distinct in view of the observation of immunological abnormalities and an apparent susceptibility to infection in Cree encephalitis. We recently reported localisation of a gene for AGS on chromosome 3p21 (AGS1).8 Our results suggested the existence of locus heterogeneity, with approximately 50% of families mapping to AGS1. In view of their phenotypic similarity, we hypothesised that AGS and Cree encephalitis might represent allelic disorders. Such a possibility was further strengthened by the observation of acrocyanosis, resulting in auto-amputation of the digits, in one child with Cree encephalitis.5 This description is reminiscent of the chilblain-like lesions seen in AGS.3,9 Because of the consistent association of raised levels of CSF IFN-α with AGS, we undertook to measure IFN-α in patients with Cree encephalitis. Additionally, using samples from families affected by Cree encephalitis, we performed a linkage analysis across the AGS1 interval. We report the results of these studies here. Fourteen children are known to have been affected by Cree encephalitis since 1966 (fig 1). Blood or tissue samples from seven affected children, their parents, and four unaffected sibs were available for linkage analysis (fig 2). CSF and serum interferon alpha levels were measured in three of these affected subjects. The study was approved by the Leeds Health Authority/United Teaching Hospitals NHS Trust Research Ethics Committee, the Eeyou Awaash Foundation, and the Cree Board of Health and Social Services of James Bay, Canada. 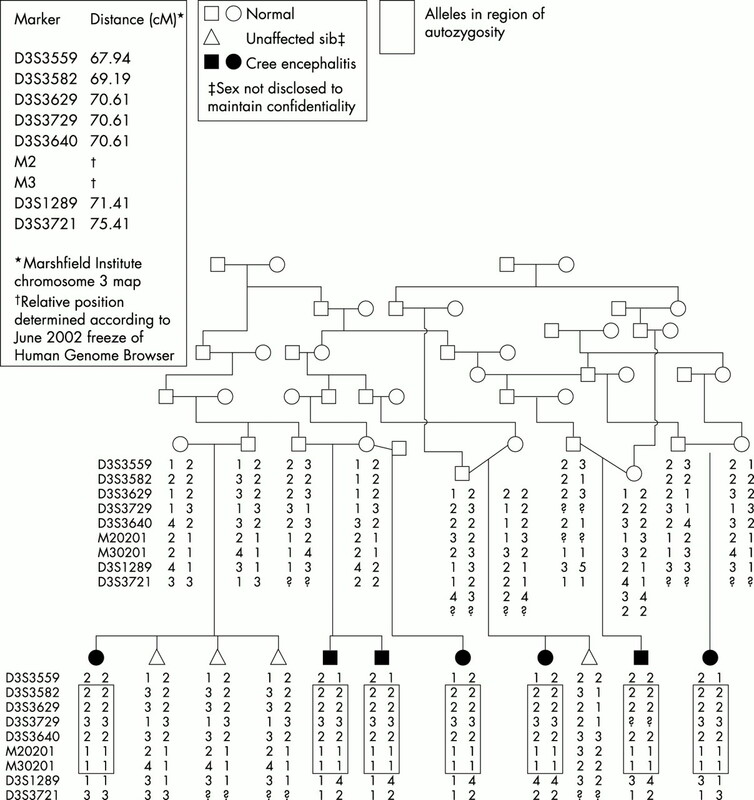 Simplified Cree encephalitis pedigree showing genotype data for selected subjects and markers across the Cree ancestral haplotype. All seven affected children included in this study showed progressive microcephaly, intracerebral calcification, and severe psychomotor delay. Only five of these seven exhibited raised numbers of white cells (>5 cells/mm3) in the CSF. However, IFN-α levels were raised in all three subjects examined, including the two children (XII.12 and XIV.3) with normal CSF white cell counts (table 1). In one case (XI.8), serum and CSF IFN-α levels were consistently raised over a 12 month interval. A number of extra-neurological features were also noted. Specifically, abnormalities of liver function and derangement of haematological and immunological indices were observed frequently (table 2). Genotyping across the AGS1 locus identified a Cree ancestral haplotype homozygous in all seven affected subjects available for study (fig 2). 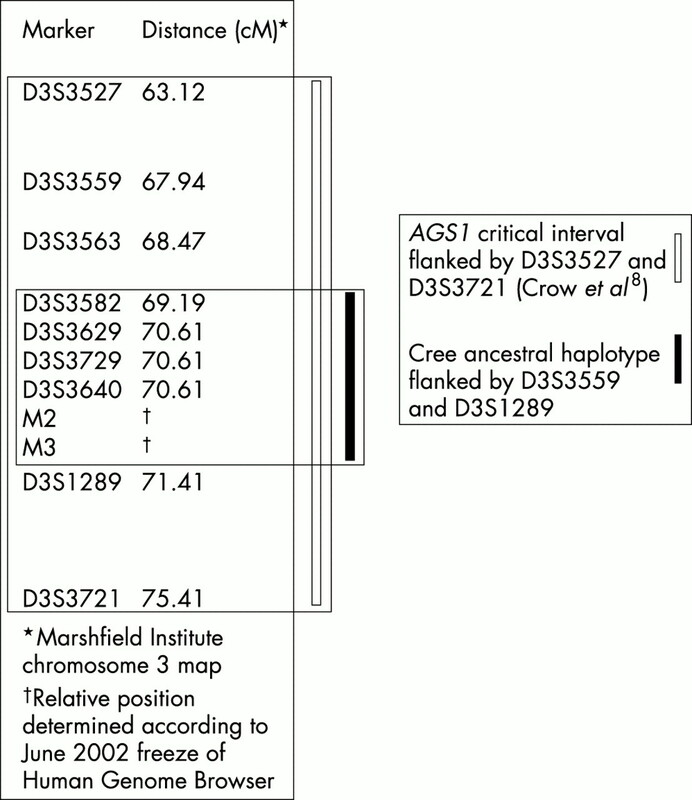 Two point linkage analysis of markers across this Cree ancestral haplotype gave positive lod scores with a maximum score of 4.14 at D3S3629 (𝛉=0) (table 3). The 3.47 cM interval consistent with linkage lies between markers D3S3559 and D3S1289 and falls within 1 lod unit support interval of the maximum AGS1 HLOD score8 (fig 3). Schematic to show relative positions of AGS1 critical interval8 and Cree ancestral haplotype. In view of their phenotypic similarity, we hypothesised that AGS and Cree encephalitis might represent allelic disorders. The finding of raised levels of IFN-α in the children with Cree encephalitis specifically investigated is consistent with this hypothesis. Moreover, our genetic data confirm linkage of Cree encephalitis to the AGS1 locus on chromosome 3p21 and indicate that we have successfully refined the AGS1 critical interval to lie between D3S3559 and D3S1289 (fig 3). Because of probable genetic homogeneity in the Cree population, our data suggest that prenatal diagnosis of Cree encephalitis by linkage is now feasible. Locus heterogeneity precludes such a possibility in AGS at the present time. We have previously drawn attention to the phenotypic overlap of AGS with pseudo-TORCH syndrome (MIM 251290).8,14 Both conditions show basal ganglia calcification, a leucoencephalopathy, and brain atrophy. However, they are said to differ by the presence in pseudo-TORCH syndrome of an early onset microcephaly, neonatal disturbance of liver function with thrombocytopenia, and a normal CSF white cell count.15 Importantly, the majority of children described here showed significant thrombocytopenia and abnormalities of liver function. Moreover, while most affected subjects showed a CSF leucocytosis, two children had raised levels of CSF IFN-α despite normal CSF white cell counts. This latter observation confirms earlier reports suggesting that a CSF pleocytosis should not be considered mandatory for the diagnosis of AGS and highlights the importance of IFN-α measurement in this condition.8,16 On the basis of these findings, we suggest that AGS and pseudo-TORCH syndrome are probably the same disorder. We hypothesise that the phenotypic similarities shared by AGS, SLE, congenital rubella and in utero HIV infection result from the abnormal regulation of IFN-α. In the case of prenatally acquired rubella and HIV infections, IFN-α production is presumably triggered by viral exposure, with the pathological consequences determined by the developmental stage at which exposure occurs. The mechanism for stimulation of IFN-α production in SLE is unknown.40 However, evidence exists for the presence of specific IFN-α inducing activity in the serum of SLE patients39,45 and induction of dendritic cells by IFN-α possibly driving the autoimmune response.46 In the case of AGS/Cree encephalitis/pseudo-TORCH syndrome, excess IFN-α production might result from an inborn error of IFN-α metabolism. Identification and characterisation of the AGS1 gene may therefore provide new insights into the control of IFN-α production and its role in congenital infection and particular autoimmune diseases. We wish to express our gratitude to the families for their participation in this study. We would like to thank the Eeyou Awaash Foundation (Annie Bearskin, President; William Neacappo, Vice-President) for their support. We would also like to acknowledge the Genethon cell bank repository, Lilia Brassart for sample preparation, and Marie-Claude Lameboy, RN, for collection of Cree samples. Work in the authors’ laboratory is funded by the Wellcome Trust and the Medical Research Council. Aicardi J, Goutiéres F. A progressive familial encephalopathy in infancy with calcifications of the basal ganglia and chronic cerebrospinal fluid lymphocytosis. Ann Neurol1984;15:49–54. Lebon P, Badoual J, Ponsot G, Goutiéres F, Hémeury-Cukier F, Aicardi, J. Intrathecal synthesis of interferon-α in infants with progressive familial encephalopathy. J Neurol Sci1988;84:201–8. Goutiéres F, Aicardi J, Barth PG, Lebon P. Aicardi-Goutiéres syndrome: an update and results of interferon-α studies. Ann Neurol1998;44:900–7. Goutiéres F. Aicardi-Goutiéres syndrome. Neurobase. 1st ed. Michigan: Arbor Publishing Corp, 2000. Black DN, Watters GV, Andermann E, Dumont C, Kabay M, Kaplan P, Meagher-Villemure K, Michaud J, O’Gorman G, Reece E. Encephalitis among Cree children in Northern Québec. Ann Neurol1988;24:483–9. Black DN, Booth F, Watters GV, Andermann E, Dumont C, Halliday WC, Hoogstraten J, Kabay ME, Kaplan P, Meagher-Villemure K. Leukoencephalopathy among native Indian infants in Northern Québec and Manitoba. Ann Neurol1988;24:490–6. Black D, Harris R, Schiffman R, Wong K. Fatal infantile leukodystrophy: a severe variant of CACH/VWM syndrome, allelic to chromosome 3q27. Neurology2002;58:161–2. Crow YJ, Jackson AP, Roberts E, van Beusekom E, Barth P, Corry P, Ferrie CD, Hamel BC, Jayatunga R, Karbani G, Kalmanchey R, Kelemen A, King M, Kumar R, Livingstone J, Massey R, McWilliam R, Meager A, Rittey C, Stephenson JBP, Tolmie JL, Verrips A, Voit T, van Bokhoven H, Brunner HG, Woods CG. Aicardi-Goutiéres syndrome displays genetic heterogeneity with one locus (AGS1) on chromosome 3p21. Am J Hum Genet2000;67:213–21. Tolmie JL, Shillito P, Hughes-Benzie R, Stephenson JBP. The Aicardi-Goutiéres syndrome (familial, early onset encephalopathy with calcifications of the basal ganglia and chronic cerebrospinal fluid lymphocytosis). J Med Genet1995;32:881–4. O’Connell JR, Weeks DE. PedCheck: a program for identification of genotype incompatibilities in linkage analysis. Am J Hum Genet1998;63:259–66. Lathrop GM, Lalouel JM, Julier C, Ott J. Strategies for multilocus analysis in humans. Proc Natl Acad Sci USA1984;81:3443–6. Gresser I, Tovey MG, Bandhu M, Maury C, Brouty-Boye D. Role of interferon in the pathogenesis of viral disease as demonstrated by the use of anti-interferon serum. Rapid evolution of encephalomyelitis virus infection. J Exp Med1976;144:1305–15. Ankel H, Westra DF, Welling-Wester S, Lebon P. Induction of interferon-α by glycoprotein D of herpes simplex virus: a possible role of chemokine receptors. Virology1998;251:317–26. Stephenson JBP, Tolmie J, Heckmatt J, Tang S, Tatnall F, Lebon P. Aicardi-Goutiéres syndrome: autoimmune clues to diagnosis and pathogenesis, and link to microcephaly intracranial calcification syndrome. Dev Med Child Neurol1997;39(suppl 77):15. Reardon W, Hockey A, Silberstein P, Kendall B, Farag TI, Swash M, Stevenson R, Baraitser M. Autosomal recessive congenital intrauterine infection-like syndrome of microcephaly, intracranial calcification, and CNS disease. Am J Med Genet1994;52:58–65. Østergaard JR, Christensen T, Nehen AM. A distinct difference in clinical expression of two siblings with Aicardi-Goutiéres syndrome. Neuropediatrics1999;30:38–41. Dale RC, Tang SP, Heckmatt JZ, Tatnall FM. Familial systemic lupus erythematosus and congenital infection-like syndrome. Neuropediatrics2000;31:155–8. Aicardi J, Goutiéres F. Systemic lupus erythematosus or Aicardi-Goutiéres syndrome? Neuropediatrics2000;31:113. Maddison PJ, Isenberg DA, Woo P, Glass DN. Oxford textbook of rheumatology. 2nd ed. 1988. Oxford: Oxford University Press, 1988:1196-9. Raya GP, Aguado GA, Merlo SM, Uriol LP, Astudillo VA, Puig GJ. Massive cerebral calcification in systemic lupus erythematosus: report of an unusual case. Lupus1994;3:133–5. Stuart BM, Gregson NA. Cerebral calcification in a patient with systemic lupus erythematosus and a monoclonal IgG reactive with glial fibrillary acidic protein. Br J Rheumatol1998;37:1355–7. Mathur A, Choudhary HR. Systemic lupus erythematosus causing cerebral infarction and basal ganglia calcification: a case report. Neurol India2000;48:91. Raymond AA, Zariah AA, Samad SA, Chin CN, Kong NC. Brain calcification in patients with cerebral lupus. Lupus1996;5:123–8. Bachmeyer C, Farge D, Gluckman E, Miclea JM, Aractingi S. Raynaud’s phenomenon and digital necrosis induced by interferon-alpha. Br J Dermatol1996;135:481–3. Creutzig A, Freund M. Severe Raynaud’s syndrome associated with interferon therapy. A case history. Angiology1996;47:185–7. Campo-Voegeli A, Estrach T, Marti RM, Corominas N, Tuset M, Mascaró JM. Acrocyanosis induced by interferon-α2a. Dermatology1998;196:361–3. Cid MC, Hernández-Rodríguez J, Robert J, del Río A, Casademont J, Coll-Vinent, B, Grau JM, Kleinman HK, Urbano-Marquez A, Cardellach F. Interferon-α may exacerbate cryoglobulinemia-related ischaemic manifestations: an adverse effect potentially related to its anti-angiogenic activity. Arthritis Rheum1999;42:1051–5. Akwa Y, Hassett DE, Eloranta ML, Sandberg K, Masliah E, Powell H, Whitton JL, Bloom FE, Campbell IL. Transgenic expression of IFN-α in the central nervous system of mice protects against lethal neurotropic viral infection but induces inflammation and neurodegeneration. J Immunol1998;161:5016–26. Campbell IL, Krucker T, Steffensen S, Akwa Y, Powell HC, Lane T, Carr DJ, Gold HG, Henriksen SJ, Siggins GR. Structural and functional neuropathology in transgenic mice with CNS expression of IFN-α. Brain Res1999;835:46–61. Kumar D, Rittey C, Cameron AH, Variend S. Recognisable inherited syndrome of progressive central nervous system degeneration and generalised intracranial calcification with overlapping phenotype of the syndrome of Aicardi and Goutiéres. Am J Med Genet1998;75:508–15. Barth PG, Walter A, van Gelderen I. Aicardi-Goutiéres syndrome: a genetic microangiopathy? Acta Neuropathol1999;98:212–16. Strannegard O, Hermodsson S, Westberg G. Interferon and natural killer cells in systemic lupus erythematosus. Clin Exp Immunol1982;50:246–52. Ytterberg SR, Schnitzer TJ. Serum interferon levels in patients with systemic lupus erythematosus. Arthritis Rheum1982;25:401–6. Dussaix E, Lebon P, Ponsot G, Huault G, Tardieu M. Intrathecal synthesis of different alpha-interferons in patients with various neurological diseases. Acta Neurol Scand1985;7:504–9. Kim TY, Kanayama N, Negoro N, Okamura M, Takeda T, Inoue T. Serum levels of interferons in patients with systemic lupus erythematosus. Clin Exp Immunol1987;70:562–9. Rönnblom L, Alm GV, Öberg KE. Possible induction of systemic lupus erythematosus by interferon-α treatment in a patient with a malignant carcinoid tumour. J Intern Med1990;227:207–10. Tolaymat A, Leventhal B, Sakarcan A, Kashima H, Monteiro C. Systemic lupus erythematosus in a child receiving long-term interferon therapy. J Pediatr1992;120:429–32. Kälkner KM, Rönnblom L, Karlsson Parra AK, Bengtsson M, Olsson Y, Olberg K. Antibodies against double-stranded DNA and development of polymyositis during treatment with interferon. Q J Med1998;91:393–9. Batteux F, Palmer P, Daëron M, Weill B, Lebon P. FCγRII (CD32)-dependent induction of interferon-alpha by serum from patients with lupus erythematosus. Eur Cytokine Netw1999;10:509–13. Rönnblom L, Alm GV. A pivotal role for the natural interferon-α producing cells (plasmacytoid dendritic cells) in the pathogenesis of lupus. J Exp Med2001;194:F59–63. Belman A, Lantos G, Horoupian D, Novick B, Ultmann M, Dickson D, Rubinstein A. AIDS: calcification of the basal ganglia in infants and children. Neurology1986;36:1192–9. Kauffman W, Sivit C, Fitz C, Rakusan TA, Herzog K, Chandra RS. CT and MR evaluation of intracranial involvement in pediatric HIV infection: a clinical-imaging correlation. AJNR1991;13:949–57. DeCarli C, Civitello L, Brouwers P, Pizzo P. The prevalence of computed tomographic abnormalities of the cerebrum in 100 consecutive children symptomatic with the human immunodeficiency virus. Ann Neurol1993;34:198–205. Krivine A, Tovey M, Taty-Taty R, Lebon P. Endogenous interferon-alpha in newborns from HIV seropositive mothers. J Interferon Res1992;12:S151. Vallin H, Blomberg S, Alm GV, Cederblad B, Ronnblom L. Patients with systemic lupus erythematosus (SLE) have a circulating inducer of interferon-α production acting on leukocytes resembling immature dendritic cells. Clin Exp Immunol1999;115:196–202. Blanco P, Palucka AK, Gill M, Pascual V, Banchereau J. Induction of dendritic cell differentiation by IFN-α in systemic lupus erythematosus. Science2001;294:1540–3.